As I mentioned two days ago, the biergarten door needed more work than simply removing the old (new) door, and installing the new (old) door. 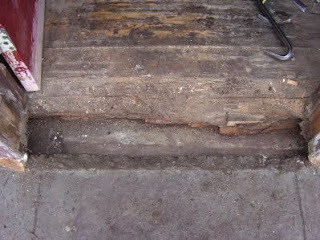 As with the main entrance, the wood under the biergarten door sill was rotten, and the door frame wasn't in an appealing condition either. Fortunately, it was a beautiful day, which helped (not only to sooth my mood for the task at hand) because I had to remove the door for most of the day. 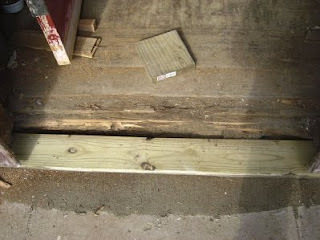 Just as with the main entrance, I scraped out the bad wood, and installed a sill with pressure treated wood. 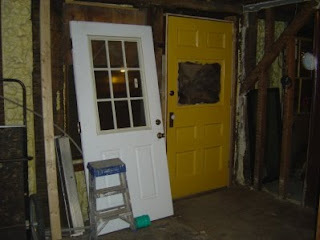 With the old frame out, I installed some reinforcement before the new frame, because the new (old) door is really heavy. Still left to be done is the outdoor trim, which E! was busy priming and painting today.